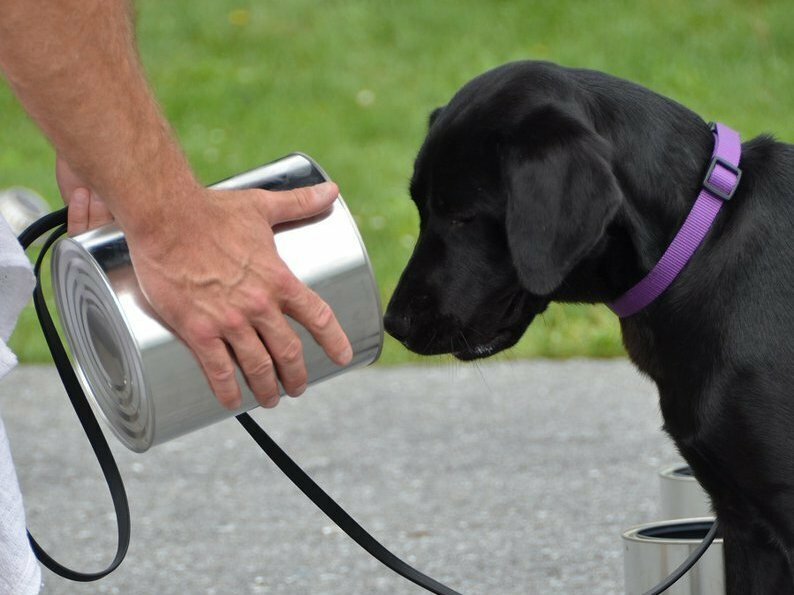 CIA Trainee Washes Out Of Bomb Detection, Reassigned To Living Room : The Two-Way The agency says that Lulu, a black Labrador being trained to sniff out explosives, just wasn't that into it. Lulu photographed during explosives training. Some jobs are just not a good fit. That seems to have been the case for a certain canine trainee named Lulu at the Central Intelligence Agency. The black Labrador was in an intensive course of study to learn how to sniff out bombs. But Lulu just wasn't that interested. "[It's] imperative that the dogs enjoy the job they're doing," the CIA writes in a news release on Wednesday announcing Lulu's reassignment to her handler's living room. If you're a dog, sniffing out explosives is apparently one of those jobs that you either love or hate. And Lulu just couldn't muster the mojo for poking her muzzle into metal cans and around concrete blocks hoping to catch the distinctive aroma of C-4 or some other bomb component. "Sometimes, even when a pup tests well and they successfully learn how to detect explosive odors, they make it clear that being an explosive detection K9 is not the life for them," according to the agency. "A few weeks into training, Lulu began to show signs that she wasn't interested in detecting explosive odors," the release said, adding that it is sometimes a temporary phase for canine trainees. For Lulu however, even treats and playtime couldn't motivate her. "[She] was clearly not enjoying herself any longer," the CIA said. In such cases, the agency says, "the handler or handler's family is given the chance to adopt them. Most handlers, of course, choose to do so. ... Lulu was adopted by her loving handler, who had the chance to work with her during imprint training." Not surprisingly, Lulu is already attracting a following under the hashtag #CIAK9 and might just get her 15 minutes of fame as a meme star.